Alarm Cat Press, 9780990794998, 316pp. 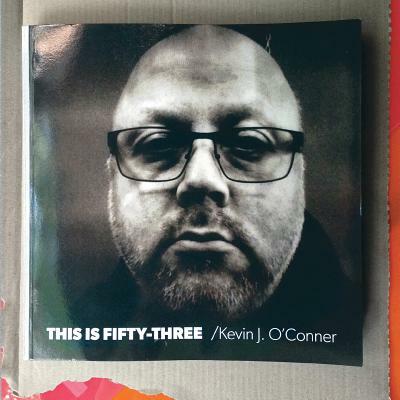 This is Fifty-three is Kevin J. O'Conner's seventh collection of poems--and his most ambitious to date. This is not your typical poetry collection or photography book. Instead, it is an exploration, through words and pictures, of living with uncertainty at a time when we'd expect most of life's big questions to have been already answered. This Is Fifty-three breaks many of the unwritten rules governing poetry books, from its 8.5" x 8.5" format to its full-color interior, with graphics and/or photographs accompanying each poem. To emphasize the personal nature of the work, a self-portrait of the poet appears on the front cover. In my poems, I have continued to try out different forms and styles in order to stretch myself as a writer. As for the visuals, my previous books used images to mark the boundaries between sections; here, they are an integral part of the whole, whether complementing the text, or providing a counterpoint--or stirring things up. The end result, for better or for worse, is an honest portrayal of me at age fifty-three. --Kevin J. O'Conner, August 2016.